After eight years in the glaring spotlight, Michelle Obama took some well-earned time off when she left the White House. Now, her rest is well and truly over as she tours the world to mark the release of her autobiography. Obama has taken over big stages with the help of friends like Tracee Ellis Ross and Oprah Winfrey, been on the cover of Elle Magazine and discussed everything, from growing up in the South Side of Chicago to marrying Barack, who would later become the President of the United States. Fashion is part and parcel of being a woman in the public eye, and Obama has proved over the last few years that she is a thoughtful and considered dresser, who manages to keep her personality in what she wears – despite the intense scrutiny she faces, particularly as a woman of colour. She writes in her new book, Becoming: "It seemed that my clothes mattered more to people than anything I had to say." She later adds: "This stuff got me down, but I tried to reframe it as an opportunity to learn, to use what power I could find inside a situation I’d never have chosen for myself. If people flipped through a magazine primarily to see the clothes I was wearing, I hoped they’d also see the military spouse standing next to me or read what I had to say about children’s health." Obama started the tour in her hometown of Chicago, enlisting Oprah to help interview her. For the event, she kicked things off with a bang in an off-the-shoulder sequinned top and matching white trousers. Both are by Sally LaPointe, and are a prime example of Obama consistently choosing to support designers of colour. Bonus points for adding a pop of colour with bright pink heels. If it’s one thing Obama knows, it’s how to choose a perfectly-tailored suit. 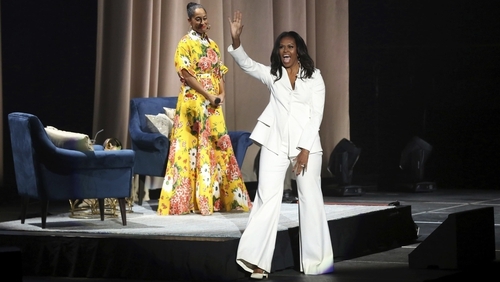 For her Los Angeles conversation with actor Tracee Ellis Ross, the former FLOTUS chose an all-white custom Christian Siriano suit. The look was standout in being all-white-everything, paired with white heels for even more of a statement. In an interview with the podcasting duo 2 Dope Queens, Obama discusses the need for her fashion to be versatile – one moment she would be playing with kids, and the next attending a state dinner – as First Lady, she had to always be prepared and think of every eventuality. The same goes for her book tour – while most of it is held onstage, there are also moments like this one, when she read to children at the Para Los Niños charity in the Skid Row neighbourhood of LA. Staying true to her power-dressing ethos, Obama wore a suit, but kept things fun and lighthearted by wearing all-denim and a pop of colour in her yellow shoes. As Obama’s book tour continues, it’s becoming clear that suits are her sartorial bread and butter. We can’t blame her, because tailoring is the ultimate form of power dressing, with the ability to be as fierce as it is chic. This black suit by Christopher Kane she wore in Washington DC is perfect for the upcoming party season – it’s a chic two-piece tuxedo, with the sparkly accent adding some understated glamour. Never one to settle for just a plain suit, Obama mixed up classic black tailoring with a subtle brocade pattern and more sparkles with a statement necklace. Obama’s Elle cover photo made an instant splash when it was revealed recently. Her stylist Meredith Koop, who’s been with her through the White House years and also on this tour, chose what she would wear – looking to represent Obama’s personality as well as the magazine’s. To do so, Koop picked out all Dior – a white flowing skirt with a matching shirt, given an edge with a black leather corset. The resulting image is nothing short of joyous and powerful.